Directed by Keisuke Kinoshita and screenplay by Tadao Ikeda from a story by Shohei Hino, Army is the story of a Japanese family who hope to be involved in the army to fulfill with the wishes of the generation before them. The film is a look into the legacy of a family as they cope with the ways of the world and what it means to serve their country during wartime. Starring Chishu Ryu, Kinuyo Tanaka, Kazumasa Hoshino, Eijiro Tono, Ken Uehara, Ken Mitsuda, and Haruko Sugimura. Army is a powerful and evocative film from Keisuke Kinoshita. The film follows three generations of a family from the mid-19th Century to World War II as they all have desires to be part of the military and serve their country. Much of the film’s narrative is told during Japan’s occupation of Manchuria and into World War II as much of the first act is about a young man helping a militia soldier and in return is given a collection of books chronicling Japan’s history. Years later toward the end of the 19th Century, he passes the books to his son who would sign up to join the army and succeed but doesn’t see any action due to recurring illnesses. He hopes his son would follow in his footsteps but his son is wracked with fear yet would eventually sign up to be in the army but isn’t sure about stepping into the battlefield. Tadao Ikeda’s script follows mainly the life of Tomohiko (Chishu Ryu) who did serve his time as an army captain but never stepped foot in the battlefield as he is eager to instill everything he’s learned from the books he has inherited into the next generation of soldiers. Yet, Tomohiko finds himself at odds with the man who has hired him but also in the role his son Shintaro (Kazumasa Hoshino) has taken. Keisuke Kinoshita’s direction is definitely mesmerizing in the way it approaches everything in a simple way. Though there’s moments in the film that do spout some Japanese propaganda due to the fact that the film was funded by the Japanese government during World War II. While much of the compositions in the film are very straightforward, Kinoshita does create some scenes that are still engaging such as a meeting between Tomohiko and an old man where Tomohiko’s wife Waka (Kinuyo Tanaka) is in the background from afar. Kinoshita’s usage of the wide shots are quite intense where it has a lot of coverage as it play into the evolution of Japan’s military as it’s more focused on training and trying to be part of something bigger than the individual. 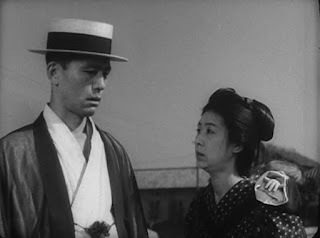 Yet, the film is noted for an ending that was considered very controversial in its initial 1944 release as it relates to the role that Shintaro has to play for Japan. Notably as it’s shown from the perspective of someone close to Shintaro who see what he’s become and accomplished for the family but is it really worth it? Even as there is so much emphasis to honor the emperor and so much for the country unaware of the personal cost it would do to a family. Overall, Kinoshita creates a compelling and heartfelt film about a family’s desire to serve their country during wartime. Cinematographer Yoshio Taketomi does brilliant work with the film’s black-and-white photography as it is very straightforward with some lovely lighting for some of the film’s nighttime interior/exterior scenes. Production designer Isamu Motoki does excellent work with the film’s art direction from the pawn shop that Tomohiko runs that he’s inherited from his father and grandfather to places in the small town he and his family live at. The film’s amazing cast include some notable small roles from Ken Mitsuda as Tomohiko’s father Tomonojo, Ken Uehara as an old military officer and friend of Tomohiko in Nishina, Haruko Sugimura as Shintaro’s friend Setsu, and Eijiro Tono as Setsu’s father Sakuragi who would give Tomohiko a job in teaching young soldiers. Kazumasa Hoshino is superb as Shintaro as a young man eager to please his father while coping with the expectations laid upon him as he also tries to find his own path into the world of the army. Kinuyo Tanaka is fantastic as Shintaro’s mother/Tomohiko’s wife Waka who deals with the expectations toward her family as well as steering Shintaro into the right path and pondering everything that is expected for the country. Finally, there’s Chishu Ryu in an incredible performance as Tomohiko as a man who is eager to fulfill his father’s wishes by serving in the army as he later copes with his own failure and hoping his son would be the one to fulfill the wishes only to deal that his ideas about service are becoming obsolete. Army is a sensational film from Keisuke Kinoshita. It’s a film that explores the idea of servitude in the Japanese army during World War II and the pressure instilled upon those serving and the demands to honor its emperor. Even it means win at all cost. In the end, Army is a phenomenal film from Keisuke Kinoshita.